Butterfly Ginkgo small cheese board and knife. Board, 16.5"W x 5.75"D x 1.75"T; knife, 6"L.
Board of marble with natural and oxidized brass detail. Knife of stainless steel with oxidized brass handle. Signature Nixon patterning in gleaming, hand-cast brass. Board, 15"W x 7"D x 2"T. Brass finished with food-safe lacquer. Board of gorgeous Carrara marble. Knife with stainless steel blade. Imported. 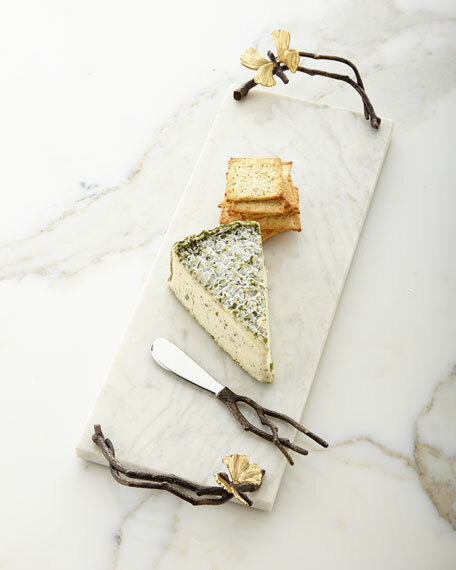 EXCLUSIVELY AT NEIMAN MARCUS Handcrafted cheese board and knife. Board, 18.5"L x 10"W x 3"T; knife, 7.75"L. Granite, natural and oxidized bronze, and stainless steel. Not dishwasher or microwave safe. Hand wash with gentle, nonabrasive detergent; do not soak or leave unwashed overnight. Imported.